The directors of Dead List discuss their upcoming horror movie. 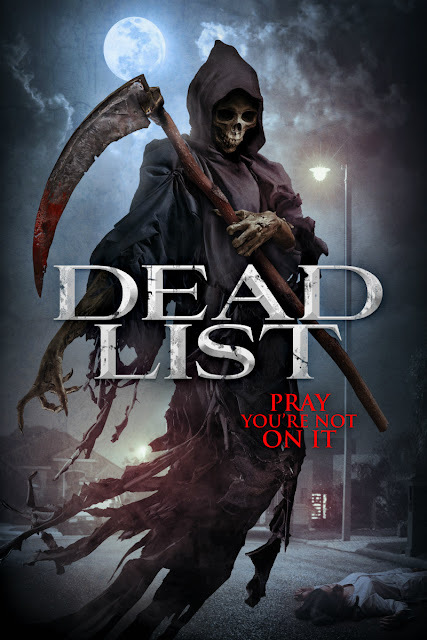 In Dead List, a struggling actor conjures a dark force in order to win a movie role in a terrifying new movie. We speak to filmmakers Holden Andrews and Victor Mathieu (Ivan Asen is the third member of the troupe) about conjuring up such a unique concept for their May horror release. How would you describe the flick to the readers? Calvin is competing with five other actors for the lead role in a major Hollywood movie. Stopping at nothing to win the role of a lifetime, he uses a demonic book to curse his fellow actors, with each being killed by a different monster in a unique and horrifying way. How suspenseful is it? How high is our blood pressure likely to rise here? Dead List is an aggressively suspenseful film and will peak your blood pressure. Make sure you’re in good health before sitting down to watch it! If you are scared by monsters, then you should watch out for Dead List because it has over five monsters that were designed to put you on the edge of your seat. What’s the most unnerving scene in the movie - is there one that stands out over another? Honestly there are so many in Dead List. But without listing spoilers, Kush’s chapter you’ll leave you brain stained. We’ll be impressed if anyone can watch it without looking away. And if you hate clowns, like we do, then you’re in for a treat because our clown will stay with you after this film and never let you go. We know what scares Indiana Jones. And we know what the townspeople in Zodiac were rattled by. What freaks you out? Clowns, psychological mind tricks, and what’s in the water with you that you can’t see. Serial killers. I don’t want to know how they think. I also think it’s wrong to expose the human brain to that type of thinking as some people are more susceptible than others and may be influenced to do wrong. I do not support serial killer films except for those such as Scream, Halloween, or Friday the 13th - if the serial killer wears a mask, there is an automatic dissociation that occurs that makes me personally feel more comfortable and you are therefore kept separated from the knowledge of a serial killer’s thinking patterns. Do you remembered being ever, truly scared by anything or anyone in real life? Yes, any clown (evil or not); old women who might be witches; and that thing that brushes against your leg when you’re in the water. If you live in Los Angeles, you’ll come across some really scary and strange people every once in a while… Thinking about it, the scariest and weirdest people I’ve met in my life were while holding auditions here in Los Angeles. What about films? Do they have the potential to still scare you - even though you know how they essentially made, well, this and that? Yes, a good story takes you away from your reality and puts you into its. Once you’re there you are at the will of the film. That’s why films are so great, they have the power to do anything they want to you once they have you. Absolutely. Films are made out of ideas that originate from personal experiences. They come from somewhere, and they have truth to them. That’s what makes horror movies scary in the end, if told well - they are inspired by reality. Which filmmakers do you admire at the moment? Denis Villeneuve, The Russo Brothers and David Robert Mitchell. From large scale films to smaller indies, these guys are inspiring to filmmakers like myself. I am encouraged by their creativeness, successes, and ability to expand out from the genres they started in. Guillermo Del Toro and Tim Burton are the two directors that I aspire to be like. I also really enjoy James Wan and the stylistic signature he stamps onto each one of his films. I’m also very fond of Jason Blum, his ability to pick the right projects and for understanding what is marketable as well as for re-establishing the horror genre as a popular movie genre. Have you ever reached out to one of your favorite filmmakers to see if they’d like to work on something together? I haven’t yet but when I do I will have my pitch and package prepared and I’ll be swinging for the fences. I can’t say that I have, yet I will soon be reaching out to Jason Blum with something I’ve been developing for a while… I also hope to meet Guillermo and Michael Bay. What about actors? Ever reached out to one of your favorite actors and actually gotten them to do your movie? Only for other projects where I haven’t been the lead. On the right project with the right circumstances I’ll have no problem reaching out to pitch a role. I’m working on that right now, although I cannot say her name since it is a work in progress at the moment. Why should audiences check out the movie? The three of us are true fans of horror and have favourite films that span the genre. Between us we love films like The Blob, The Exorcist, V/H/S, IT, Goosebumps, Creepshow, Evil Dead and the television show The Twilight Zone. We partnered together to make Dead List, a new take on the horror anthology genre. Instead of having multiple chapters that tell different stories we made an anthology film where each chapter continues to tell a singular narrative of the film. The inspiration for the film comes from us all living in LA and working in the film industry. We wanted to tell a story about the seedy underbelly of Hollywood, framing Dead List around a group of actors who are interested only in excelling their own careers by any means possible. If you are a horror fan, love monsters, and are excited by unique and horrify deaths then Dead List is the perfect horror movie to check out. It has something for everyone. We had a blast making it and we know that you will have an even better time while watching it!